For other uses, see Rolls-Royce. This article is about the BMW subsidiary established in 1998. It is not to be confused with Rolls-Royce Motors. Rolls-Royce Motor Cars Limited engineers, manufactures and distributes luxury automobiles and automobile parts worldwide. Rolls-Royce Motor Cars Limited is a wholly owned subsidiary of BMW established in 1998 after BMW was licensed the rights to the Rolls-Royce brand name and logo from Rolls-Royce PLC and acquired the rights to the Spirit of Ecstasy and Rolls-Royce grill shape trademarks from Volkswagen AG. Rolls-Royce Motor Cars Limited operates from purpose-built administrative and production facilities opened in 2003 across from the historic Goodwood Circuit in Goodwood, West Sussex, England, United Kingdom. Rolls-Royce Motors Cars Limited is the exclusive manufacturer of Rolls-Royce branded motor cars since 2003. Although the Rolls-Royce brand has been in use since 1906, the Rolls-Royce Motor Cars subsidiary of BMW AG has no direct relationship to Rolls-Royce branded vehicles produced prior to 2003. The Bentley Motors Limited subsidiary of Volkswagen AG is the direct successor to Rolls-Royce Motors and various other predecessor entities that produced Rolls-Royce and Bentley branded cars between the foundation of each company and 2003, when the BMW-controlled entity started producing cars under the Rolls-Royce brand. The Rolls-Royce Phantom four-door sedan was the first product offered for sale in 2003. Since then, Rolls-Royce Motor Cars has expanded its product line up to include an extended wheelbase version of the Phantom sedan, a Phantom two-door coupé and Phantom convertible version and the less expensive Ghost four-door sedan and Wraith two-door coupé. Rolls-Royce Motor Cars Limited was created as a wholly owned subsidiary of BMW in 1998 after BMW licensed the rights to the Rolls-Royce brand name and logo from Rolls-Royce PLC and acquired the rights to the Spirit of Ecstasy and Rolls-Royce grill shape trademarks from Volkswagen AG. Rolls-Royce Motor Cars Limited has been manufacturing Rolls-Royce branded cars since 2003. Current chief executive Torsten Müller-Ötvös joined the company in January 2010, with a pledge to regain the quality standards that made Rolls Royce famous in the 1980s. That year, the company's sales in China increased by 600%, meaning that it is now Rolls Royce's second largest market after the US. In 1998, Vickers decided to sell Rolls-Royce Motors. The most likely buyer was BMW, who already supplied engines and other components for Rolls-Royce and Bentley cars, but BMW's final offer of £340 million was beaten by Volkswagen's £430 million. A stipulation in the ownership documents of Rolls-Royce dictated that Rolls-Royce plc, the aero-engine maker, would retain certain essential trademarks, including the Rolls-Royce name and logo if the automotive division was sold. Although Vickers plc sold the vehicle designs, nameplates, administrative headquarters, production facilities, Spirit of Ecstasy and Rolls-Royce grill shape trademarks to Volkswagen AG, Rolls-Royce plc chose to license the Rolls-Royce name and logo to BMW AG for £40 million, because Rolls-Royce plc had recently had joint business ventures with BMW. BMW's contract to supply engines and components to Rolls-Royce Motors allowed BMW to cancel the contract with 12 months' notice. Volkswagen would be unable to re-engineer the Rolls-Royce and Bentley vehicles to use other engines within that time frame. With the Rolls-Royce brand identification marks split between the two companies and Volkswagen's engine supply in jeopardy, the two companies entered into negotiations. Volkswagen agreed to sell BMW the Spirit of Ecstasy and grill shape trademarks and BMW agreed to continue supplying engines and components until 2003. Volkswagen continued to produce Rolls-Royce branded vehicles between 1998 and 2003, giving BMW time to build a new Rolls-Royce administrative headquarters and production facility on the Goodwood Estate near Chichester, West Sussex, and develop the Phantom, the first Rolls-Royce from the new company. Rolls-Royce Motor Cars Limited became the exclusive manufacturer of Rolls-Royce branded cars in 2003. Rolls-Royce announced in September 2014 that a new technology and logistics centre will be built, due to open in 2016, 8 miles away from the main headquarters, in the seaside resort town of Bognor Regis. From 2010 – Ghost 4-door sedan. Rolls Royce announced in September 2006 that it would develop a new four-door model named Ghost. 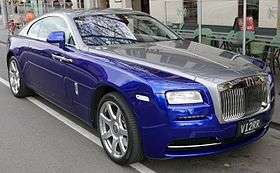 The Ghost will be smaller than the previous Rolls Royce automobile launched, the Phantom. Only 20% of the components would be sourced from BMW F01 7 Series, and it will be positioned below the Phantom. On 4 March 2014, the new Ghost Series II was revealed to the public at the Geneva Motor Show. It has a facelift front with new LED headlights. The interior has had an update as well. From 2013 – Rolls-Royce Wraith coupé. Rolls-Royce Motor Cars launched a new car at the Geneva Motor Show on 5 March 2013. The new car, named the Rolls-Royce Wraith (in honour of the original Wraith built by the original Rolls-Royce Limited from 1938-1939) was a luxury coupe, with a long bonnet and a sleek roof line, and was a coupe version of the Ghost. It was powered by a 623 bhp, twin-turbocharged V12 engine connected to an 8-speed gearbox. Deliveries were expected to begin by the end of 2013. Rolls-Royce had stated that the Wraith would be the most powerful Rolls-Royce motor car to that date. 2015 Rolls-Royce announced the production of SUV for the very first time in the company history. According to Rolls Royce, "the new SUV will set new luxury standards among cars of this segment". It is likely to be rolled out in 2017 as a 2018 model. 2003-2016 – Phantom 4-door sedan. Launched in January 2003 at Detroit's North American International Auto Show, this is the first model from Rolls-Royce Motor Cars Limited. The car has a 6.75 L V12 engine sourced from BMW, but most components are unique to the car. Parts are sourced from Continental Europe and the UK. Assembly, leather work, wood work, and finishing are carried out in a new factory in Goodwood near Chichester, Sussex. 2005-2016 – Rolls-Royce Phantom Extended Wheelbase. This car's wheelbase is 250mm longer than that of the standard Phantom sedan. The all-time high record of sales was achieved in 2014, at 4,063 cars, beating 2013 sales by 433 cars. In 2011, Rolls-Royce Motor Cars Limited sold 3,538 cars, an increase of 31 percent compared to 2010, beating the previous sales record from 1978. The strong sales growth occurred in the Asia Pacific region, Britain and the Middle East with sales increases of 47 percent, 30 percent and 23 percent respectively. ↑ "Rolls-Royce plans Bognor Regis technology centre". BBC News. Retrieved 24 June 2015. ↑ "2010 Rolls-Royce Ghost - Specifications, Pictures, Prices". Leftlanenews.com. Retrieved 29 July 2010. ↑ "Rolls-Royce Ghost Series II" (PDF) (Press release). Rolls-Royce Motor Cars. 4 March 2014. p. 2. Retrieved 8 March 2014. ↑ Peter Orosz. "Rolls-Royce Wraith: This Is It". Jalopnik. Retrieved 24 June 2015. ↑ "2014 Rolls-Royce Wraith Set for 2013 Geneva Auto Show". Edmunds. 18 January 2013. Retrieved 24 June 2015. ↑ "Rolls-Royce Unveils Plan to Build a Super Luxury SUV". The Wall Street Journal. Retrieved 18 February 2015. ↑ "Rolls-Royce SUV on course for 2018 debut". Yahoo News. Retrieved 2016-01-07. ↑ "SUV da Rolls Royce já rola com o nome Cullinan". Retrieved 23 April 2015. ↑ "Rolls-Royce 'Cullinan' SUV spotted testing | Autocar". www.autocar.co.uk. Retrieved 2016-01-21. ↑ "2008 Rolls-Royce Hyperion Images, Pricing and News". Conceptcarz.com. Retrieved 29 July 2010. ↑ Blanco, Sebastian. "Rolls-Royce Mini auf autobloggreen". Green.autoblog.com. Retrieved 26 September 2011. ↑ Savov, Vlad. "The Rolls-Royce Vision 100 concept is completelty, irredeemably ridiculous". The Verge. Retrieved 18 June 2016. 1 2 "ROLLS-ROYCE MOTOR CARS CELEBRATES FIFTH SUCCESSIVE SALES RECORD". Rolls-Royce Motor Cars. 6 January 2015. 1 2 "January 9, 2012 - Luxury carmaker Rolls-Royce enjoys record sales". 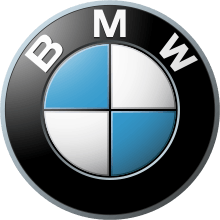 ↑ "BMW reports 90% drop in 2008 net profit to 330 million euro". Bmwblog.com. Retrieved 26 September 2011. 1 2 3 Usrey, Bryan (11 January 2011). "Rolls-Royce Has Massive Sales Year in 2010". Carnewsbreak.com. Retrieved 26 September 2011. ↑ "Rolls-Royce Announces Record Sales In Company's 108-year History". Rolls-Royce Motor Cars. 10 January 2013. Retrieved 2 February 2013. ↑ "Rolls-Royce says it is looking at designs for a 4x4 vehicle, as it reports record sales". BBC News. 9 January 2014. Retrieved 9 January 2013. Wikimedia Commons has media related to Rolls-Royce Motor Cars.